See also the about page, complete article index, sitemap, or master list of self-help tips. There are also reading guides for patients & professionals. Spinal manipulation: one of the classic treatment options. But does it actually work? There are countless treatments for people in pain. Scams are everywhere, but so is evidence-based hope. Get started with a big compilation of pain survival tips, with links to dozens more articles about popular DIY treatments like self-massage, ice or heat, or the amazingly controversial Epsom salts. I also review major therapy methods like massage, chiropractic, and acupuncture. The Art of Rest — The finer points of resting strategy when recovering from injury and chronic pain (hint: it’s a bit trickier than you might think). Can’t find something? This is not a complete index. It’s focused on the highlights in this category. For more obscure topics, use the search box at the top of the page or the complete articles index. Does Massage Therapy Work? — A review of the science of massage therapy … such as it is. Trigger Points & Myofascial Pain Syndrome — A guide to the unfinished science of muscle pain, with reviews of every theory and self-treatment and therapy option. This is a huge, comprehensive guide. Fascial therapy — A trendy style of massage aimed “releasing” connective tissue by pulling on it artfully. Poisoned by Massage — Rather than being DE-toxifying, deep tissue massage can probably cause a slightly toxic situation in the body. How to Find a Good Massage Therapist — Lots of tips for finding good quality medical massage therapy in your area (especially trigger point therapy). The Pressure Question in Massage Therapy — What’s the right amount of pressure to apply to muscles in massage therapy and self-massage? The Bath Trick for Trigger Point Release — A clever way of combining self-treatment techniques to self-treat your trigger points (muscle knots). Massage Therapy Side Effects — What could possibly go wrong with massage? The risks and side effects of massage therapy are usually mild, but “deep tissue” massage can cause trouble. Deep Friction Massage Therapy for Tendinitis — A guide to a simple self-massage technique sometimes helpful in treating common tendinitis injuries like tennis elbow or Achilles tendinitis. Massage Therapy for Tension Headaches — Perfect Spot No. 1, in the suboccipital muscles of the neck, under the back of the skull. The first of a series of 14 articles about “perfect spots” around the body for massage. Why I Quit My Massage Therapy Career — The story of how I was formally investigated for professional misconduct because I criticized pseudoscience in alternative medicine. I quit the profession instead of submitting to regulatory censure and censorship.  Massage Therapists Say — A compilation of more than 50 examples of the bizarre nonsense spoken by massage therapists with delusions of medical knowledge. The Chiropractic Controversies — An introduction to chiropractic controversies like aggressive billing, treating kids, and neck manipulation risks. Spinal Subluxation — Can your spine be out of alignment? Chiropractic’s big idea has been misleading patients for more than a century Probably not. 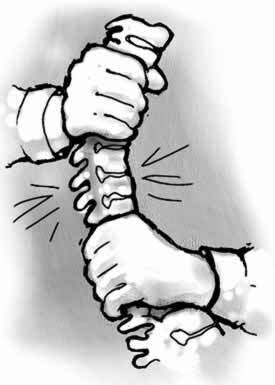 Does Spinal Manipulation Work? — Spinal manipulation, adjustment, and popping of the spinal joints and the subluxation theory of disease, back pain and neck pain. Organ Health Does Not Depend on Spinal Nerves! — One of the key selling points for chiropractic care is the anatomically impossible premise that your spinal nerve roots are important to your general health. Digital Motion X-Ray — What’s the risk from the radiation exposure? Is the diagnostic potential worth it? Does Epsom Salt Work? — The science of Epsom salt bathing for recovery from muscle pain, soreness, or injury. Does Arnica Gel Work for Pain? — A detailed review of popular homeopathic (diluted) herbal creams and gels like Traumeel, used for muscle pain, joint pain, sports injuries, bruising, and post-surgical inflammation. Voltaren® Gel Review — A useful rub-on anti-inflammatory medication for arthritis, tendonitis, bursitis, runner’s knee, and muscle strain. Opioids for Chronic Aches & Pains — The nuclear option: “Hillbilly heroin” (Oxycontin), codeine and other opioids for musculoskeletal problems like neck and back pain. Can Supplements Help Arthritis and Other Aches and Pains? — Debunkery and analysis of supplements and food-like medicines (nutraceuticals), especially glucosamine, chondroitin, and creatine, mostly as they relate to pain. Vitamin D for Pain — Is it safe and reasonable for chronic pain patients to take higher doses of Vitamin D? And just how high is safe? Zapped! Does TENS work for pain? — The peculiar popularity of being gently zapped with electrical stimulation therapy. Does Ultrasound Therapy Work? — Many concerns about the widespread usage of therapeutic ultrasound, especially extracorporeal shockwave therapy (ESWT). Kinesio Taping Review — A quick analysis of that colourful therapy tape that was so popular at the Olympics. Does it help? Cold Laser Therapy — A critical analysis of treating pain and injury with frickin’ laser beams. Spinal Fracture Bracing — My wife’s terrible accident, and a whirlwind tour of the science and biomechanics of her spine brace. Are Orthotics Worth It? — A consumer’s guide to the science and controversies of orthotics, special shoes, and other allegedly corrective foot devices. Does barefoot running prevent injuries? — A dive into the science so far of barefoot or minimalist “natural” running. Hydrotherapy, Water powered rehab — A guide to using warm and cold water as a treatment for pain and injury. Icing for Injuries, Tendinitis, and Inflammation — Become a cryotherapy master. (Almost) Never Use Ice on Low Back Pain! — An important exception to conventional wisdom about icing and heating. The Great Ice vs. Heat Confusion Debacle — A quick guide that explains when to ice, when to heat, when not to, and why. Heat for Pain — A detailed guide to using heat as therapy for acute and chronic pain. Hot Baths for Injury & Pain — Tips for getting the most benefit from a hot soak, the oldest form of therapy. Contrast Hydrotherapy — “Exercising” tissues with quick changes in temperature, to help with pain and injury rehab (especially repetitive strain injuries). Icing, Heating & Tissue Temperature — How much do ice packs and heating pads change the temperature of muscle and joints?. Does Platelet-Rich Plasma Injection Work? — An interesting treatment idea for arthritis, tendinopathy, muscle strain and more. Stem cell therapy — See the platelet-rich plasma article — the topics overlap so much they are almost the same thing. What I have written about PRP is nearly a clone of what I would write about stem cell therapy. Should You Get A Lube Job for Your Arthritic Knee? — Reviewing the science of injecting artificial synovial fluid, especially for patellofemoral pain. Do Nerve Blocks Work for Neck Pain and Low Back Pain? — Analysis of the science of stopping the pain of facet joint syndrome with nerve blocks, joint injections, and nerve ablation. Does Cartilage Regeneration Work? — A review of knee cartilage “patching” with autologous chondrocyte implantation (ACI). Knee Surgery Sure is Useless! — Evidence that arthroscopic knee surgery for osteoarthritis is about as useful as a Nerf hammer. Extracorporeal shockwave therapy (EWST) — expensive, hyped and totally unproven for most conditions. Tissue Provocation Therapies — Can healing be forced? The laws of tissue adaptation & therapies like Prolotherapy & Graston Technique. Knee Replacement Surgery Doubts — Knee replacement is extremely popular, but still not yet based on good evidence of efficacy. Does Acupuncture Work for Pain? — A review of modern acupuncture evidence and myths, focused on treatment of back pain & other common chronic pains. Therapeutic Touch is Silly — No touch included! Auras don’t exist and can’t be felt, let alone massaged for medical benefit. Homeopathy Schmomeopathy — Homeopathy is not a natural or herbal remedy: it’s a magical idea with no possible basis in reality. Does Craniosacral Therapy Work? — Craniosacral therapists make big promises, but their methods have failed to pass every fair scientific test of efficacy or plausibility. Do You Believe in Qi? — How to embrace a central concept of Eastern mysticism without being a flake. T’ai Chi Helps Fibromyalgia, but It’s Not “Alternative” Medicine — Despite a high profile boost from the New England Journal of Medicine, it’s still just gentle, elegant, and pleasant exercise. Mind over pain — The second half of my main review of pain science gets as practical as possible about the “mind over pain” idea. The Tyranny of Yoga and Meditation! — Do you really need to try them? How much do they matter for recovery from conditions like low back pain? The Art of Bioenergetic Breathing — A potent tool for personal growth and transformation. Civilization Survival Tips — Coping with stress and anxiety in the modern world (without drugs). Critical Analysis Review of Dr. John Sarno’s Books & Ideas — Sarno’s methods are historically important, based on a kernel of an important truth that has been blown waaaay out of proportion. Modality Empires — The trouble with the toxic tradition of ego-driven, trademarked treatment methods in massage therapy, chiropractic, and physiotherapy. Healer Syndrome — The problem with health care professionals, especially in alternative medicine, who want to be known as “healers”. Choose Cheaper, Safer Treatments — All other things being equal, always choose the cheapest and safest treatment option for your pain problem. Popular but Weird & Dangerous Cures — The most dangerous, strange, and yet popular snake oils and “treatments” in history (and why anecdotes and testimonials cannot be trusted). Alternative Medicine’s Choice: Alternative to What? — Alternative to what? To cold and impersonal medicine? Or to science and reason? Extraordinary Health Claims — A guide to critical thinking, skepticism, and smart Internet reading about health care. Pseudo-Quackery in the Treatment of Pain — The large, dangerous gray zone between evidence-based care and overt quackery in musculoskeletal and pain medicine.